Michelin-starred chef Marcus Wareing has seen his Petrus restaurant take the accolade for top tastes in London. 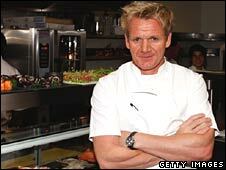 Harden's London Restaurants guide for 2009 has placed Wareing ahead of his former mentor, TV chef Gordon Ramsay, in the top price category. Last year Restaurant Gordon Ramsay held on to the best food and service titles in the £80-plus bracket despite losing its best overall rating to Petrus. This year Petrus won the overall title and the food and service categories. "For the first time this millennium, London has a clear new best restaurant at the top end of the market," says the guide, based on feedback from 8,000-plus regular restaurant-goers. Petrus is the restaurant at the Berkeley Hotel in Knightsbridge, and won its second Michelin star last year. It is run by Gordon Ramsay Holdings but the hotel has said it would hand the lease to Wareing this September when the current lease runs out. The accolade came after Wareing criticised Gordon Ramsay in Waitrose Food Illustrated magazine. "If I never speak to that guy again in my life it wouldn't bother me one bit," Wareing said. 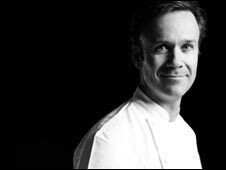 The restaurant guide's co-editor Peter Harden said: "Marcus Wareing is emerging from Ramsay's shadow as the proprietor of what is now clearly the best restaurant in London, and he and his team should be congratulated. "Marcus would now appear to be well on the way to his stated intention of equalling the three Michelin star rating Ramsay currently holds at Restaurant Gordon Ramsay." Mr Harden also points out: "Restaurant Gordon Ramsay has had a very good innings - eight years at the top - and still maintains very high standards. "In the end though it is hardly surprising that an impassioned individual concentrating on one establishment has overtaken the flagship of an ever more celebrity-driven empire where the 'name' chef is rarely present." Mr Harden observed that three of Ramsay's recently-opened restaurants, The Warrington, Devonshire House, and Foxtrot Oscar, had not been well received by critics. Meanwhile, Chez Bruce on Wandsworth Common held on to its title as Londoners' favourite restaurant for the fourth straight year. The Harden's guide said average cost of dinner for one in London - including house wine, coffee and service - was now an average £40.11, with prices increasing 4.7% over the last 12 months.